The ability to publish or delete multiple items at once is available to users who have permission to publish. If you are unsure as to whether you have permission to publish, check out this article. 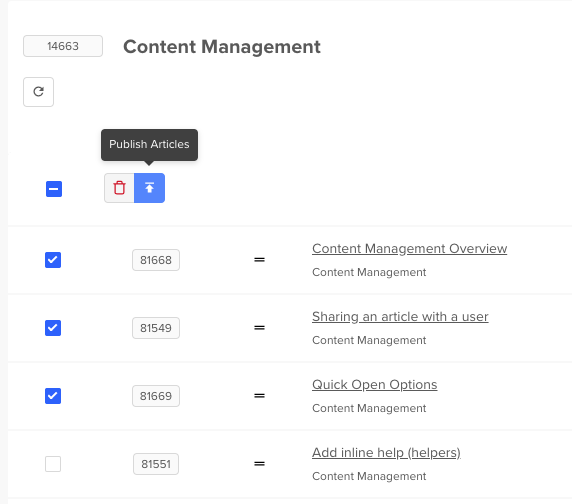 Publish or delete multiple items at once by selecting the checkbox of each article that you want to publish or delete, and then the Publish or Trash button. Learn more about publishing articles here. N.B: Articles may not be immediately published or deleted. They are placed in a queue for publishing or deletion. As such, you may need to click the refresh icon after a moment to check whether the article has been published or deleted if you see no change yet. If your article is in an external knowledge base and you want it gone forever, it must be also be deleted from your external knowledge base or it will return upon a resync of content. i.e., you must manually delete the content from both elevio, and the third party source.